Ever worried your shared videos might be used without your permission? Visitors can download whatever they like from popular video sharing websites, like YouTube, Vimeo and Facebook with some technical help. Thus, the original works you shared might be used without your consent in a way that you never wanted to do. Even though it is hard to deter video thief, you still can watermark your original videos to build brand awareness. Let others know original maker of these awesome works. How to Watermark Video Quickly? To watermark videos quickly and efficiently, you need to apply some watermark software, like Video Watermark Software. With the help of this powerful program, you will feel effortlessly to embed text, image (including animated one), logo, signature to your videos in a minute. Its user-friendly interface and superfast processing speed will make you feel extremely convenient to operate it. Just with a few of clicks, you can watermark a batch of videos. 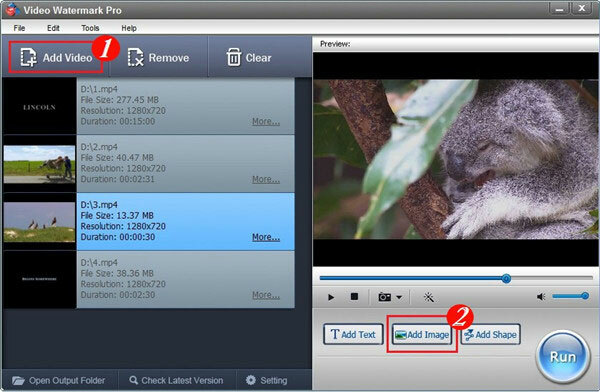 Video Watermark Software is an excellent solution to protect and annotate your online videos. Want to brand your videos now? Download it to have a free trial. Now follow the steps below, you will learn how to watermark video in details. Run Video Watermark Software, you will come to the main interface. Click “Add Video” to import the source video you would like to watermark or drag it to the program. Add text, image and shape watermark as you wish by clicking “Add Text”/”Add Image”/”Add Shape”. Here we will take text watermark as an example. Click “Add Text”, you will see the interface below. ①At first, click “Add” button to create a text layer where you can edit your text watermark. ②Type some words/symbols you want in the textbox and then jump to Font Setting Interface to edit more by clicking “Font” button. ③Adjust other settings such as Opacity, Rotate. Specify “General”/”Title”. Adjust position of watermark over the photo. Click “OK”, you will return to the main interface and then click “Run” button, the output interface will pop up. ①Specify output folder and output format. There are a wide range of video formats provided for you, including AVI, MPEG, MP4, WMV, MKV, MOV, RM, 3GP, FLV, SWF, VCD, and DVD. ②Modify video setting and audio setting as you want. ③Click “Run” button to start watermarking video. Video Watermark Software allows you to embed text, image, logo, signature and animated image to your video in batch mode. There is no any functional limitation in free trial. But the unregistered version of Video Watermark Software will put words “Unregistered Version” on output files. If you want to get rid of these words, please purchase license key first (purchase now you can get 50% discount). License code will send automatically within minutes after you purchased. Registered user will get free upgrade, free support and 30 day money back guarantee.